All aboard. (Right) Khun Kad, Khun Srisuda, Khun Zar Zar and Debra. 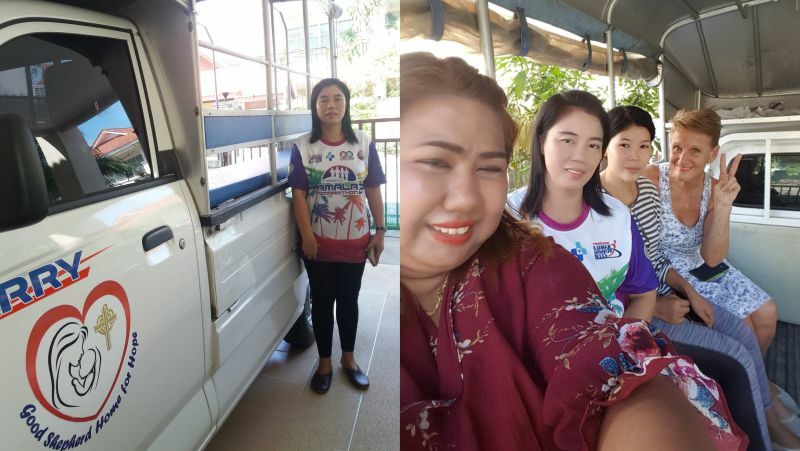 The target audience for the mobile unit is woman and children at risk of human trafficking, being abused and exploited and who live in risky com­munity areas in Phuket. The goal is to educate the women in social and life skills, health, self-care and awareness of human trafficking. The director of this new project is Good Shepherd’s Sister Dr Euphrasia Mesomklin and the manager is Khun Ratchaneekorn (Kad) who has worked for Home for Hope and the anti-human trafficking project in Patong. personal care items (shampoo, soap, brushes, toothpaste, toothbrushes, hairbrushes etc). Donations can be dropped off at Home for Hope (located in Topland near the bypass road in Phuket Town) or at the Thrift & Crafts Shop at Wana Park, 177 Moo 4, Srisoonthorn Rd, Thalang (open 10am-2pm on Monday, Wednes­day and Saturday). The bus also requires a trailer to carry all donated goods and supplies. The Good Shepherd Foundation is also looking for one Thai and one Myanmar social worker – to assist with family and social issues and provide information about human rights, laws and villages rights – and one Thai and one Myanmar nurse – to advise and assist with basic health screenings, vaccinations, heath advice, specific care and follow up services. Respect to all those involved,especially those expats who truly contribute to the community compared to those faceless keyboard warriors and serial complainer who always pretend to care about Thailand but actually are extreme selfish and only worried about their own-aged in bitterness-life.